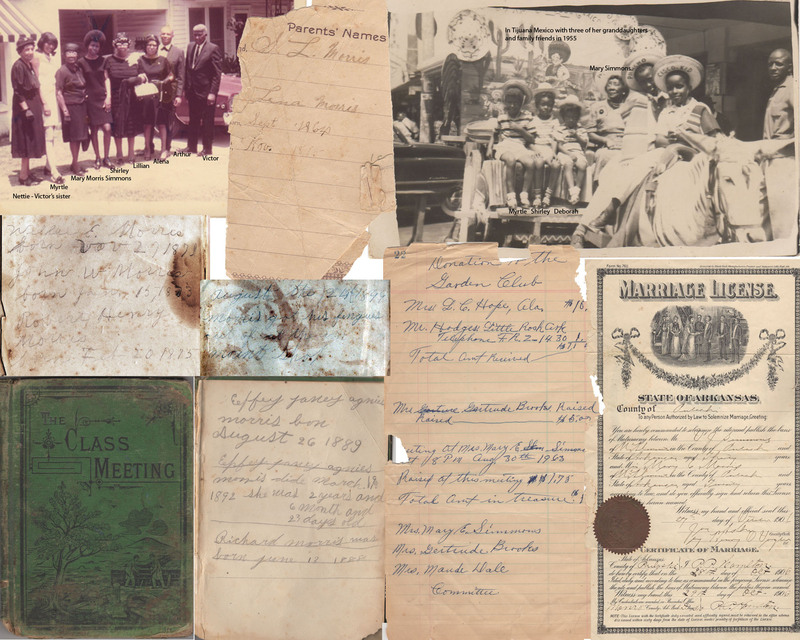 Pages from the green book, notes and photographs. Click to enlarge. This is my 4th year participating in the A-Z Challenge. I am writing about people who were born into slavery and lived to be free, and their descendants. I was hoping to find an Xavier among my formerly enslaved people. No such luck, so today I am writing about Mary Morris Simmons, the wife of Dr. Victor J. Simmons who I wrote about yesterday in the post Victor James Simmons MD – Bermuda to Arkansas. I will begin with Mary’s parents. Mary’s mother Alena Fluellen was born about 1855 in Georgia. In the 1870 census she lived in Bibb County, Georgia. Family relationships are not specified in the 1870 census. The household consisted of two adults. Mitchel Johnson was 30 and worked as a farm laborer. Forty year old Edith Johnson kept house. There were three children – Alena Johnson 13, Nancy Johnson 12 and Nicey Johnson 9. Everybody was born during slavery. Nancy was the only one able to read. By the 1880 census, Edith Johnson was a 51 year old widow. Two of her daughters were living with her. Alena Fluellen was 25 and Nancy Fluellen was 23. Because the two younger women were now using the name Fluellen I assume that Mitchel Johnson from the 1870 census was not their birth father and that a man named Fluellen was. All three of the women were working as laundresses. Nicey was not in the household. She may have married or she may have died. Meanwhile, also in 1880 but in Pulaski county, Arkansas, Mary’s father Stewart L. Morris was 24 years old and living with his first wife Emma and their three sons. Emma was 22. Their sons were Willie E. born 1871, John W. born 1873 and Robert Henry born in 1875. Emma and Willie were literate. Stewart was farming. He was born in Virginia about 1856. Everyone else in the household was born in Arkansas. Stewart and Alena were married in November of 1885. Mary was born in 1886. Two other children were born but died before 1900. Richard was born June 13, 1889 and died almost a month later on July 8, 1889. Effie Janey Agnus was born August 26, 1889 and died March 19, 1892. She was two years, six months and 23 days old. In a little green book titled Class Meeting, Alena or Stewart wrote the birth and death dates of all Stewart’s children, but over and over they wrote the names, birth and death dates of the two that died so young. Another entry in the little book says that Morris had his fingers cut off in 1899. Because the children are always referred to by their whole names, I believe that it was Stewart Morris who had fingers cut off. In spite of the loss of his fingers, the following year, in the 1900 Census 46 year old Stewart Morris continued to farm. Alena was listed as 29 but was closer to 45. She did not work outside of the home. She had given birth to three children, only thirteen year old Mary was living. Stewart and Alena were now able to read and write. They actually were able to earlier because one or both of them wrote all those notes in the green book. Mary was not listed as being in school that year and her occupation was said to be farm labor. Perhaps it was because she had to remain at home for awhile to help out after Stewart Morris lost some fingers. From the 1940 census we know that she completed high school. Also in 1900, Victor J. Simmons’ ship from Bermuda arrived in the United States, probably in New York. He had come to attend Meharry Medical school in Nashville, Tennessee. He completed his studies in 1904 and moved to Pulaski County to begin his medical practice on the advice of a fellow graduate. In 1906 Mary Morris and Victor J. Simmons were married in Pulaski County. She was 20 and he was 30. Stewart Morris gave them land to build a house on with enough space for a garden and fruit trees. Victor practiced medicine and Mary kept the house and raised their six children. Lillian was born in 1907. Alena (named for Mary’s mother) was born in 1910. Victor (named for his father) was born in 1912. McDonald (named for Victor’s brother) was born in 1914. Johnie was born in 1919 and died in infancy. Roscoe was the youngest, born in 1924. All were born in Pulaski County, Arkansas. In the 1940 census, Mary and Victor had two children still living at home. 24 year old Victor had completed two years of college. He was not employed. 16 year old Rosco was a high school student. Mary did not work outside the home. She had completed high school. Victor had finished college, plus medical school. He was still practicing medicine. A month after the census was taken, Victor died. Mary remained in the family home. She was active in a garden club that worked and raised money to beautify Hickman Cemetery. In 1955 Mary took several of her grandchildren on a trip to California, with a side trip to Tijuana, Mexico. Mary never had to go out to work and lived a comfortable life until she died on August 15, 1973. Mary Morris Simmons is buried in Hickman Cemetery, as is her husband. I would like to find death certificates for everybody. I would like to know something about Mr. Fluellen. I would like to know where Stewart and Alena are buried and when they died. I haven’t found them after the 1900 census. I would like to know what happened to Alena’s mother and sisters. I wonder if Victor’s parents were named McDonald and Lillian because of the naming patterns, with the children being named after family members. Funny way to work “Xavier” into the post – bait and switch. I’m glad you were able to tell so much about Mary’s story. Now I’m curious about who Mr. Fluellen was too. There were a number of Fluellen’s in the area. Because parents and daughters were born during slavery, there are no records to show Mr. Fluellen as Edith’s first husband, but I would surmise that he was. Also no records to show if he died or was sold or escaped to freedom or they parted way or what. I should start looking as soon as I recover from the challenge for those problem letters for next year. Neat idea to have an eXtra Mary so that we could read her story. Wonder what happened that he lost his fingers! Of course, it was easy enough to do in many kinds of work. I grew up in logging country and lots of men lost fingers to saws and falling trees. There was a saw mill on the place, I should have mentioned that. In the several writings in the little green book, I could not make out where it happened. You are a great researcher, I have enjoyed what you have been able to find out about my family history during your A-Z challenge. You are certainly a J for Jewel for doing what you do. Awww, thank you Shirley. I’m glad we were able to chat at the doctors that day.